Find hotel near Cambridge American Cemete ..
As you stand by the flagpole, Stars and Stripes ribboning out in the wind, the first thing that will strike you is the calmness in the air. The second thing that will grab your attention is the overwhelming number of graves that lay before your eyes. 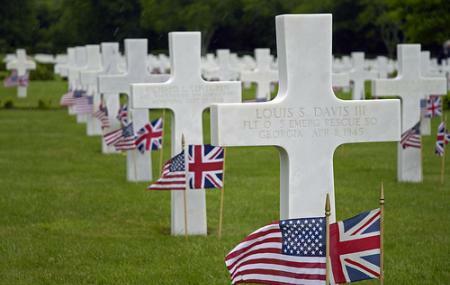 The Cambridge American Cemetery and Memorial, a tribute to the thousands of brave American soldiers that lost their lives on British soil, stands as a testament to the horrors of war and serves as a fitting final resting place for those who perished. Let serenity envelop you as walk past the meticulously maintained grass and survey the Cemetery’s fine architecture and beautiful landscaping. The Cemetery and Memorial was opened in 1943 and was one out of three temporary American cemeteries in the country. It was the only one to become a permanent fixture on British territory. The men and women who rest here fought in the Battle of the Atlantic and the bombing campaign over Europe while some departed during training exercises. The Memorial’s wall is emblazoned with the name of each identified soldier who rests here, as well as over 5000 other people whose bodies were never recovered, including airmen and sailors. The cemetery combines art, landscaping and symbolism in order to create an apt tribute to these fallen angels.Its 3,809 headstones are perfectly aligned upon the grass, in neat curving rows, at the head of fan shaped burial plots. Three clear, still pools create a tranquil environment and border the ‘Wall of Missing’. The Memorial Chapel, a 85 feet long, 30 feet wide and 28 feet high structure, contains a beautiful mosaic ceiling and windows meant to depict every American state. Finally, there’s a Visitor’s Centre, which conveys the history behind the cemetery and its residents. Visit this cemetery and pay your respects, the silence is soothing and a refreshing change from the noisiness of the city. Also, visit the popular attractions in the city by following Cambridge itinerary 1 day. The open top Sightseeing tour bus stops at the cemetery. The local number 4 bus stops approximately half a mile from the cemetery. How popular is Cambridge American Cemetery And Memorial? People normally club together King's College Chapel and Duxford Chapel while planning their visit to Cambridge American Cemetery And Memorial. It was very nice there. Out in the countryside, got there as part of the hop on-off bus. Looks to see and lot of information in the visitor center. Spend a good hour or 2 here. Is very peaceful. Worthy of a visit. We had a very poignant day at Madingley honouring Staff Sgt Harry W Estabrooks, Sgt Maurice D Robbins and Sgt Charles H Tuttle and the other seven crew members of ‘Mi Amigo’ whose B-17 came down in Endcliffe Park, Sheffield 75 years ago. At Endcliffe Park yesterday, 10,000 people gathered to mark the event which fulfilled the lifelong dream of 82-year-old Tony Foulds, who was eight years old when he saw the bomber crash into the woods next to where he and his friends were playing. Shortly after the service at Madingley, the flight of 4 F-15 Strike Eagles from RAF Lakenheath flew over the Cemetery in a very tight formation against a beautiful blue sky on their way back from the ceremony in Sheffield - a very fitting tribute. Beautiful and well maintained. The cemetery and memorial itself are a fantastic visit. However, the 16:30 taps ceremony was disgraceful. The staff member carrying out said ceremony did not fold the flag and instead elected to screw it into a ball and then lay it on the bench by the visitor centre.